The book has been in print only two years, and just over a year for the ebook; why does it need a new cover? It's more than just a face lift. 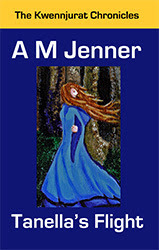 My first covers were made using CreateSpace's wonderful cover creator tool, which made some really great covers for our books. They looked very nice, and I liked them a lot. When I was ready to release the novels as ebooks, I discovered that because I had used their template and just plugged in my own information and photos, CreateSpace held the copyright on the cover, while I held the copyright on the interior only. In other words, I couldn't use the cover from my print book as the cover of the ebook. I quickly made some rather bad covers for my ebooks and released them, but I was never really happy with them. A year later, I decided to do something about it. I bought a photo editing program that would do what I needed it to do, and spent time learning how to use it. I know I'll get better with more practice, but I already like my new covers better than the old ones. The best part is that because I am now making my covers from scratch, I own all the rights to them. My ebooks and print books can now have the same cover - which will help people who have seen one version find the other one at the store. This also means everyone who bought Tanella's Flight in print now has a collector's item, an autographed first edition with the original cover, which is now out of print. The book is still in print, with the new cover, but the original black cover is no longer available, ever. Within the next month, I will be replacing the cover on Fabric of the World, so if you want to get the original cover before it's gone forever, I recommend you purchase it before August 1, when I plan to take it off the market to work on the new files.